An intertwining network of rivers and canals totaling 156 miles in total length, the Chicago River is one of Illinois' most treasured natural attractions, as well as being of important historical value. Flowing all throughout Chicago, the river is an integral part of the city's identity and a great place to enjoy various activities, including kayaking. 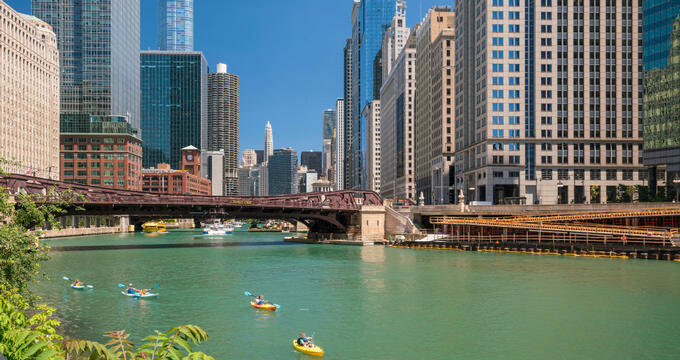 It's not uncommon at all to see residents and visitors jumping aboard kayaks and taking to the Chicago River water to enjoy the city from a whole new angle. So if you’re interested in testing out some Chicago River kayaking, what options are available to you? Well, various kayaking companies operate up and down the Chicago River at different launch points, offering rentals, tours, classes, and more. Kayak Chicago, Urban Kayaks, and Wateriders are just a few examples of top-rated companies to check out if you’d like to give kayaking a try on the Chicago River. Kayaking is an activity often associated with lakes, forests, and natural environments. It often represents a great way to get in touch with wildlife or enjoy stunning vistas or oceanic views, so why would anyone like to kayak around a huge urban metropolis like Chicago? Well, kayaking in the city can actually be a remarkably fulfilling an enjoyable experience for all sorts of reasons, and the Chicago River offers some truly astonishing opportunities for urban kayaking in one of America’s most historically significant and aesthetically breathtaking cities. With a wonderful mixture of modern high-rise buildings and more classic architecture, the city is a joy to behold, and kayaking along the Chicago River gives people whole new ways to appreciate all of that beauty and architecture. Chicago, with its rich culture and history of music and theater, is a vibrant, lively place to be, and kayaking lets you enjoy the life and soul of the city without being confined to its streets and buildings. As previously mentioned, there are various kayaking tours up and down the Chicago River, with several companies all operating in the area. One of the most unique and top-rated Chicago River kayaking tours is the 'Ghosts and Gangsters Tour' with Wateriders. As the name suggests, this tour takes a closer look at the darker side of the city, exploring Chicago's history and links with organized crime as well as investigating some local ghost stories, including a trip down one part of the Chicago River which is said to be haunted. This tour only runs at night and isn't for the faint of heart, but provides some fascinating insight into the history of the city, as well as sharing some stunning views of the city's skyline all lit up beneath the moon and stars. Another hugely popular Chicago River kayaking tour is the Architectural Tour from Kayak Chicago. Lasting three hours in length, this tour also features an introductory lesson to make sure that everyone feels fully comfortable with the kayak and their own paddling techniques before taking off. From there, the group kayaks along the river through downtown Chicago, taking a closer look at some of the famous city's most historic and beautiful buildings, as well as some more modern constructions. This tour is a big hit with anyone who wants to check out the city's sights from a completely unique angle, with experienced, knowledgeable guides leading the way and sharing their wisdom with the group. The guides are always happy to answer any questions you might have, and guest often end the tour really feeling like they've learned something. There are many other great tours to choose from. Urban Kayaks' Riverwalk Intro Paddle, for example, is perfect for beginners, offering some basic kayaking lessons along one of the Chicago River's calmest and flattest sections. The same company also offers a very popular Historic Chicago Tour, exploring some of the city's most interesting landmarks and sharing tales of how Chicago came to be such an important place. There are also special kayaking tours at certain times of the year. Often sold out in advance, these tours offer once-in-a-lifetime opportunities that no kayaker would ever want to miss out on. Fireworks paddles, for example, are highly popular. These tours take place at night and finish up with front-row seats for one of the bi-weekly fireworks shows down at Navy Pier. Some companies also offer exclusive kayaking tours on St. Patrick's Day, when the waters of the Chicago River are dyed green. No matter which kayaking tour you choose, you’re sure to have a super time on this stunning waterway.